One day Sri Krishna and His devotee, Narada Muni, were together in a beautiful forest. They were sitting among the trees next to a little river, which glittered in the sunlight. All the animals in creation gathered around Krishna and Narada Muni, delighted to be in the presence of the Lord. There were songbirds, peacocks, swans, squirrels, deer, foxes, tigers and many other creatures. And being in the presence of the Lord, they were so full of love that a deer laid down next to a tiger, and a fox affectionately licked a squirrel's ear. The devas were there as well. It was a special moment for everybody. Krishna was smiling blissfully, and everyone was happy. Narada Muni's heart was overflowing with devotion towards the Lord. His hands were caressing the holy feet of his Beloved. All of a sudden, Krishna looked deeply at Narada Muni. To test his spiritual understanding, He asked him, "Narada, what do you think? What is the greatest thing there is?" Narada felt defeated. He said, "Sorry, my Lord. You are right. It cannot be." Narada said to himself, "Now, let me think deeply because I don't want to fail again. Is there anything that can be greater than Heaven? Hmmm…" So he thought and thought. The peacocks spread their wings displaying all the beautiful colours of the rainbow, hoping to inspire Narada. But he couldn't come up with an answer. The Lord came to his rescue and said, "You see, devotion is the greatest of all things because it makes you little and humble and loving - and there is nothing greater than being little and humble and loving." 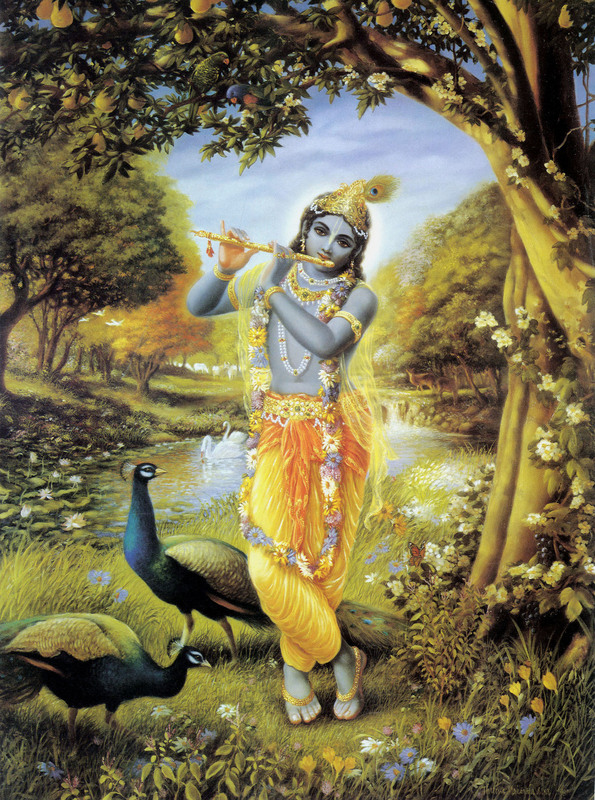 Narada, who loved the Lord more than anything in the world, was deeply moved. He took the Lord's hand and held it to his cheek. "Oh, my Lord, thank you so much," he said. "I didn't know that." The squirrels, who like all the other creatures were greatly devoted to Krishna, reverently folded their paws and said, "Squeak, squeak, squeak," which means, "Thank you very much, Krishna! We also didn't know that." It is so clear as Lord Krishna say in Bhagavad gita that he can be only achive by bhakti – devotion: bhakti mam abijananti. When we understand our relationship with God then we all will be happy. It is an essential factor for establishing peace in the world.